At the Platypus Affiliated Society's annual International Convention, held at the School of the Art Institute of Chicago April 4–6, 2014, Chris Cutrone delivered the following President's Report. An edited transcript of the presentation and subsequent discussion appears below. A full audio recording is available online at </sixth-annual-platypus-international-convention>. 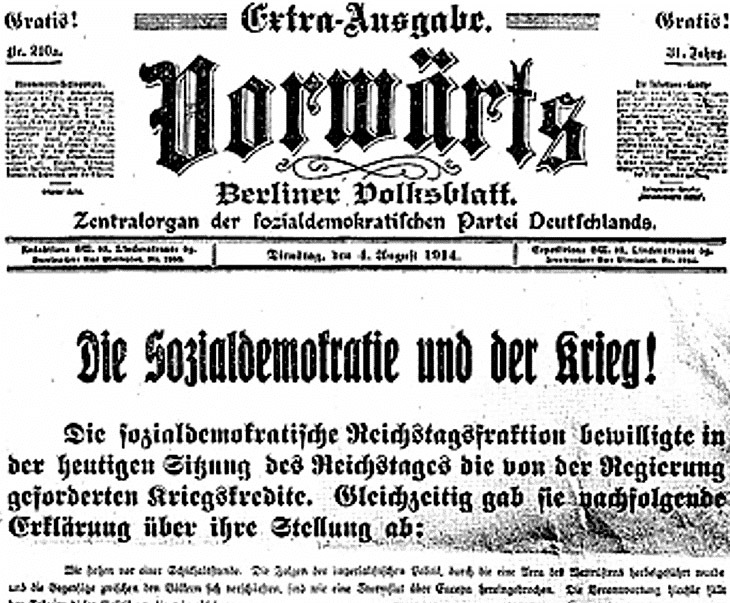 Cover of the Vorwärts, the SPD’s party organ in 1914; the headline reads, “Social Democracy and the War!” The SPD voted for war credits to the First World War almost 100 years ago on August 4 1914. Lenin was so incredulous at the SPD’s vote for war credits that he thought this issue of Vorwärts was a forgery by the German government. One hundred years later, what does the crisis and split in Marxism, and the political collapse of the major parties of the 2nd International in 1914, mean for us today? The Spartacists, for example, are constantly in search of the "August 4" moment, the moment of betrayal of the proletariat's struggle for socialism by various tendencies in the history of Marxism. The Spartacists went so far as to confess their own "August 4th" when they failed to call for the immediate withdrawal of U.S. troops from Haiti in the aftermath of the earthquake there. So, what happened, from a Marxist perspective, on August 4, 1914, when the Social Democratic Party of Germany (SPD) members of the Reichstag voted to finance the Prussian Empire's war budget? Two things: the parliamentary representatives of the SPD went against past resolutions to vote down the war effort of the German government; and the disorganization of the SPD leadership, what has been called the effective but illegitimate takeover of the party by the parliamentary delegation. No legitimate political authority of the party sanctioned this action. In all respects of principle and practice, the SPD was destroyed as a political organization as it had existed up to that point. August 4, 1914, has been called—by the Spartacists—the first great internal counterrevolution in the history of Marxism. This is entirely true. But it was a counterrevolution conducted not merely by the leadership of the SPD, however they may have abetted it, but rather by the Reich's government against the SPD membership. What was the specific character of this counterrevolution, and how was it made possible? There was a famous pair of sayings by the SPD's chairman, Bebel: "Not one man or one penny for this rotten system!" and "If it's against Russia, I myself will pick up a gun!" The German High Command, in preparation for war, took aim precisely at the contradiction between these two statements by Bebel. The German High Command wielded the specter of counterrevolution through occupation by Tsarist Russian troops against the SPD in order to prompt their preemptive counterrevolution, which they saw as an act of self-preservation, as the lesser evil. Furthermore, they thought that getting behind the war would allow them to (somehow) control it, to make the government dependent on them and so wrest political concessions from it, perhaps even undermining it, in political favor of the proletariat. This was not an unreasonable judgment. The question is whether their compromise was too much, whether the act of ostensible self-preservation was in fact actually an act of self-destruction. The SPD leadership did not want the war. They thought, however, that they couldn't prevent it: unleashing a class-struggle civil war to stop the international war was not feasible in terms of success, but would only result in the crushing of the SPD's organization, which was at least preserved if subordinated to the government through the war. So the issue is what was preserved through the compromise, the surrender to the blackmail of the war? The German government, which the original Spartacus League of Rosa Luxemburg and Karl Liebknecht considered responsible for the war, adopted a strategy of a two-front war—against both the Russians and the British and the French—despite the evident military risks of doing so. They did so in order to ensure the adherence of the Social Democrats to the war effort, out of defense against the Russians. The threat of Russian invasion and occupation, and destruction of the social-democratic workers' movement, was enough to preempt such active counterrevolution with the passive counterrevolution of the social-democratic cooperation with the war effort. In all politics there is, as Lenin put it, a "who-whom?" question: who is the agent and who is the object. The most catastrophic political mistakes the Left has made historically are in terms of this who-whom problem: for instance, the Iranian left tried to use the Ayatollah Khomeini's Islamists, but it was Khomeini who instead used the Left. The German Social Democrats, by contrast, did not seek so much to undermine the German government through cooperation, but rather merely to survive the war. Still, when the German war effort collapsed in 1918, the Social Democrats were, as a result of their collaboration, in the position to have the mantle of government fall to them, in what they considered to be a democratic—and not socialist—revolution. The apparent separation of the democratic from the socialist revolution in 1918 is what retrospectively condemns the SPD's collaboration with the German government's war effort. What confirms the political character of the vote for war credits of August 4, 1914, was the counterrevolutionary role played by the SPD in 1918–19. If the SPD had fought for socialism in 1918, then its choice to avoid confrontation and repression in 1914 would have been justified. It was not only the horror of the war that indicted the SPD's compromise in 1914, but the division around the struggle for socialist revolution later at the conclusion of the war that confirmed Luxemburg, Liebknecht, and Lenin's perspective. However, there was the perspective of Kautsky, who was consistent in considering the war an utter calamity and not any kind of occasion for struggling for socialism, either in 1914 or in 1917, and 1918–19. Kautsky condemned the Bolsheviks' overthrow of the Russian Provisional Government in 1917, which stood with the Entente against the Germans. Lenin and Trotsky's Bolsheviks were regarded by Russian nationalists as German agents for promoting an armistice, to pull Russia out of the war. But Lenin wanted to pull Russia out of the international war in order for it to participate in the civil war between the global classes of workers and capitalists. Thus Kautsky and Lenin could accuse one another of complicity in the war: Kautsky for voting for war credits to defend the SPD in the present, and thus the possibility of the struggle for socialism in the future; and Lenin for trying to use the war as an occasion for socialist revolution. Each could accuse the other of opportunism in the historical moment and of undermining—betraying—the true struggle for socialism. Luxemburg agreed with Lenin that, in itself, and apart from the immediate application of the goal in the struggle for socialism, the SPD was nothing or indeed worse than nothing, part of sustaining capitalism. For Luxemburg and Lenin, the SPD was duty-bound to launch a civil war against the German government rather than allow it to launch an international war. This is precisely the repression of the SPD Kautsky and other leaders of the SPD feared, why they thought it was impossible to stage a political confrontation with the government in 1914. Its failure to do so rendered it, in Luxemburg's terms, a "stinking corpse;" that is, dead for long enough that it was putrefying already in 1914. August 4 revealed the SPD as already dead: its past failures accumulated in it. This was not a matter of mere tactics, a military appraisal of the SPD's chances against the government's forces in 1914, but rather a matter of principle—preserving the honor of Marxism and of the workers' movement for socialism more generally. The role of Marxist parties in these instances was to serve the counterrevolution rather than the revolution. The question, then, would be not what Kautsky and Lenin had in common, but how they differed. And they differed most clearly around the issue of the war in 1914, from which their later difference over the revolution in both Russia and Germany in 1917–18 was derived. The question is the workers' movement for socialism. Kautsky considered it an end in itself, thus retroactively agreeing with Bernstein's Revisionist-reformist view of the "movement is everything, the goal nothing." Preserving the movement meant betraying its goals, whereas Luxemburg and Lenin were willing to sacrifice the movement for the goal of socialism. That is the only reason they opposed the war by opposing the war policies of the various antagonistic governments, to precipitate a global civil war of workers against capitalists. They thus did not reject the war on pacifist grounds, as Kautsky might have done, compromising with it on defensive grounds, but rather identified the war as the necessary expression of, and occasion for, the need for the struggle for socialism. As it turns out, perhaps the preemptive counterrevolution by the German government through the war must be deemed in retrospect to have been successful. Certainly the struggle for socialism let alone Marxism in the advanced capitalist countries never did recover from it. Luxemburg, Lenin, and Trotsky tried to make the First World War really into what Woodrow Wilson merely promised, a "war to end all wars." Wilson thought it was to defeat remnant feudalism; Marxists understood rather that it was to overcome capitalism. As such, Luxemburg, Lenin, and Trotsky launched a civil war: first and foremost a civil war within Marxism itself, between those who accepted the task and those who rejected and thus betrayed the duties of that civil war. That they failed in this is not proof against the task of socialism. Wilson regarded and fought against the Marxists as extremists—extremism bred of political repression in undemocratic states. But of course the conservative and opportunist character of Wilson's politics was different from that of the SPD's capitulation to the war. Or was it? Wilson didn't think that Prussian militarism or Tsarism indicted bourgeois society but were backward violations of its norms. The SPD similarly addressed the war as an abnormality. Luxemburg, Lenin, and Trotsky addressed the war as the norm: the endemic crisis of capitalism raised to a fever pitch. But the SPD and Wilson considered them to be opening the world to greater war and horror, to the greater barbarization of bourgeois society. If Wilson was no socialist, he still considered himself a defender against the threats of both Prussian militarism and Bolshevism of the norms of liberal democratic bourgeois society, which socialists considered the base-line minimum of the standards for a better society. The question and the political dispute was over how to best protect, defend, and promote the principles of that better society, to which all political actors might claim adherence, and what compromises can be justifiable in that pursuit. It is thus not a matter of pure principles but of means to their end, the true dispute of politics. Nineteen fourteen was not proof of the Marxist analysis of "imperialism" or the demonstration of the horrors of capitalism, or any other such thing: It was the division of Marxism in war and revolution at the Götterdämmerung of bourgeois society that haunts the struggle for socialism to this day, the task and duty of civil war from which the "Left" today shrinks, thus becoming a "stinking corpse," now as before. The war and the revolution are all around us, all the time. As Lenin put it, it is not as conveniently posed as the capitalists lining up on one side and the workers on the other, which would make the task very simple. No: 1914 is still with us to the extent that the workers are on both sides, and both sides could plausibly claim to be on the true side of the struggle for socialism, or at least for a better society, which is what "socialism" after all means. Nineteen fourteen was the division in the workers' movement for socialism, which was the precondition for the politics of revolution. The fact that we no longer have that politics can be traced back to the problem and task that 1914 revealed. The idea that we've inherited from 1914—Lenin as revolutionary defeatist, and defeatism as Marxist orthodoxy—really represents an innovation. It was not the norm even of Marxists who opposed the war at the time, e.g. the Zimmerwald center. Marx and Engels did not take a revolutionary defeatist stance in the wars of German unification or Franco-Prussian war, but instead tactically adopted different positions in different wars. The idea of a principled revolutionary defeatism came from Lenin's consciousness that bourgeois society had changed in the decades since then. To him, 1914 represented simultaneously the overripeness and rottenness of both bourgeois society and the SPD. This is expressed in the theory of imperialism, which is taken to be a new stage of bourgeois society. The problem with the "Leninist" view is that after the long period from 1914–1933, the principle of revolutionary defeatism becomes detached from concrete politics and is upheld simply as a principle. This is especially pronounced after WWII. When this principle is detached from the concrete possibility of a global class civil war, everything is changed. CC: I want to touch on something I glossed over in my comments in light of this. On the one hand, Luxemburg and Lenin were on the same side in the war; but on the other, they were on opposite sides. They were both revolutionary defeatists in certain respects. But one of Luxemburg's first critiques of the Bolsheviks in power is of their armistice with Germany. Luxemburg thought that by doing this Lenin would be embracing German militarism. We forget this in light of other criticisms, but it was a live issue at the time. The way these disputes—imperialism, revolutionary defeatism, etc.—are remembered by the Left now is in terms of principles, but in a particular way. Rather, we should raise the issue of the need to split the worker's movement post-1914. Lenin's "principled" assessment of WWI was bound up with this need at his historical moment. It's a principled stance with respect to a certain historical situation, but not principled in the manner of pacifism. It is actually in a way a kind of pro-war sentiment. When you said, "1914 is still with us," could you relate this to the anti–Iraq war protests? Was there still some kind of consciousness on the Left of the way the problems of 1914 are still with us? If not, what factors stand in the way of raising these problems to consciousness on the Left? CC: A government going to war takes a huge political risk, even in the case of the U.S. invading a far weaker country. The government could delegitimate itself, and thus release all sorts of problems. But the anti-war protests before the war gave the Left the false impression that there was a kind of mass sentiment, waiting to take advantage if the governments took a misstep in the war. But the anti-war protests didn't have the content the Left wanted to attribute to it. Both these protests and the Left were bound up in a conservative opposition to war, a kind of fear. But in 1914 the situation is quite different—there is the presence of the Second International. I brought up Lenin's critique of Luxemburg's Junius Pamphlet, where he's basically saying, "OK, comrade, just hold on, these governments are undermining themselves and revolution can still happen." Of course this isn't just based upon the war, but of his perception of the strength of the Second International and the SPD. Now where Luxemburg may have been right against Lenin was in thinking that the SPD was a paper tiger. But Lenin had the cooler head with respect to the historical moment. The main organizers in the 2003 anti-war movement were the International Socialist Organization, Revolutionary Communist Party (RCP), and the Workers World Party and its various offshoots like the Party for Socialism and Liberation. So the RCP would show up with their sound system and their rabble-rousers, and they would deliver speeches that sounded like they were out of a monster truck rally—except with Leftist language as their content. They thought the war just showed how fascistic the world really is. They were stuck in this 1930s frame of fascism versus communism: if you aren't a communist, you're a fascist, and if you don't think you're living under fascism, the war shows that you really are. This is far degraded, neither Luxemburg nor Lenin. Let's say the U.S. government had been completely delegitimated in the course of the Iraq war, and hundreds of thousands of soldiers were left in Iraq. Do we really think socialism would have been the result of that? Obviously not. What would have happened was a military takeover of the U.S. government, and it would have been popular. People would think only the military could save the troops in Iraq; if the executive and congress can’t do it, the military will. There would have been a military coup, a state of emergency; there would not have been socialist revolution—that's for sure. I want to bring anarchists into the discussion. In 1914, many anarchists opposed the Bolsheviks and supported the war. But nowadays we see anarchists taking up the defeatist position in an even more consistent manner than Leninists. So it seems there is an opposite course over time. CC: The anarchists who supported the war in 1914 capitulated in the same manner as Marxists in the Second International. So it is interesting that the Third International emerges not only from a split within the Second International, but also among anarchists. However, today's anarchists and Marxists aren't in a position of political responsibility, so theirs are a pseudo-anarchism and pseudo-Marxism. These people aren't going to capitulate to anything, because they don't have the political responsibility that would force them into a choice. Anarchists in 1914 were actually faced with a political choice. I would like to raise the issue of nationalism. We have until now talked about the stances of the so-called leadership of the worker's movement—but WWI showed how deeply rooted nationalist sentiments were in the masses. Before 1914 the view was that workers internationally had a common interest that would led them to fight together against their exploiters. But this illusion was destroyed by WWI. As anti-nationalists we need to keep this in mind, as it seems there is the mistaken impression that nationalism can be dispensed with easily. People think that common interests are enough to overcome nationalist ideology. Marxists—Lenin included—thought that it would not be a problem, and so the USSR gave land to various ethnicities. But we could actually say that the nation was the necessary ground for the growth of the workers' movement, and nationalism was deeply rooted in it. CC: I take exception to this, very strongly. First of all, the question of the workers "supporting the war" is tricky. That young, 18–20-year-old people could be recruited to be very nationalistic troops is very different from saying that 30–40-year-old workers organized in the SPD supported the war. There was a cosmopolitan—not merely international—culture among workers before WWI that was actively destroyed during the war. The German government estimated that the SPD was anti-war, but could be maneuvered into supporting one. They thought that as the SPD grew, and as Germany generally became more liberal and democratic, any hope of reordering Europe by military means would be progressively undermined. So the German government blackmailed them with the threat of Russian invasion. So it's not as if the war occurred independently, and the SPD underestimated the workers' support for it. These are much more closely bound up phenomena, where the thinking was of the SPD as a piece on the playing field militarily. None of the workers wanted the war. 1. See Wayne Price's remarks for the Platypus panel discussion Radical Ideologies Today: Marxism and Anarchism, at the University of Illinois at Chicago (UIC), March 19 2014. The sound recording is available online at </2014/03/21/radical-ideologies-today-marxism-anarchism-chicago-3-21-14/>.